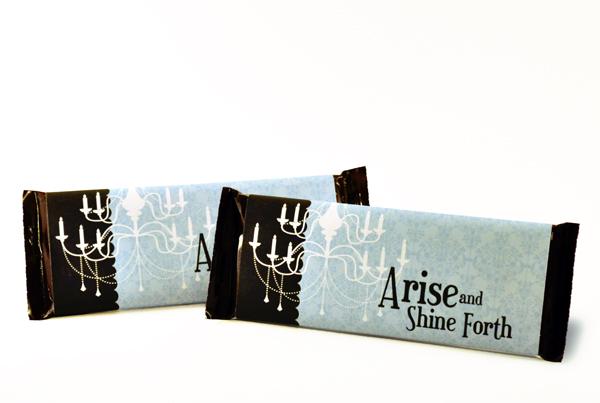 One of my fabulous Facebook followers requested an Arise and Shine Forth 2012 Mutual Theme candy bar wrapper suitable for the Young Men in her ward. I loved this idea and have created another printable 1.55-ounce Hershey’s Bar wrapper for you. It features a whole new 2012 Mutual Theme logo with a retro design feel and more masculine colors than my 2012 Mutual Theme wrapper for Young Women. 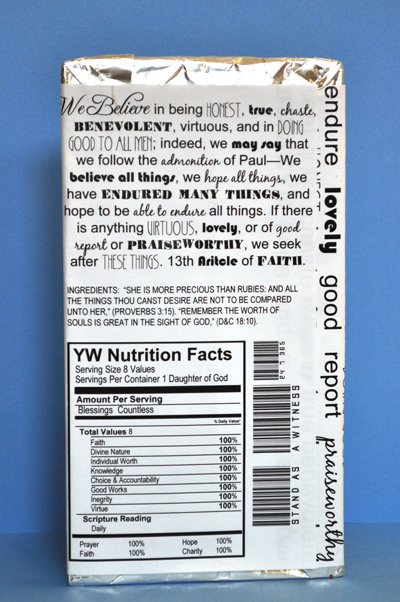 I’ve added some Young Men’s program touches to the back of the wrapper including the full 2012 Mutual Theme scripture, an ingredients list with scriptures from the Duty to God book and a “Nutrition Facts” box full of Duty to God references. 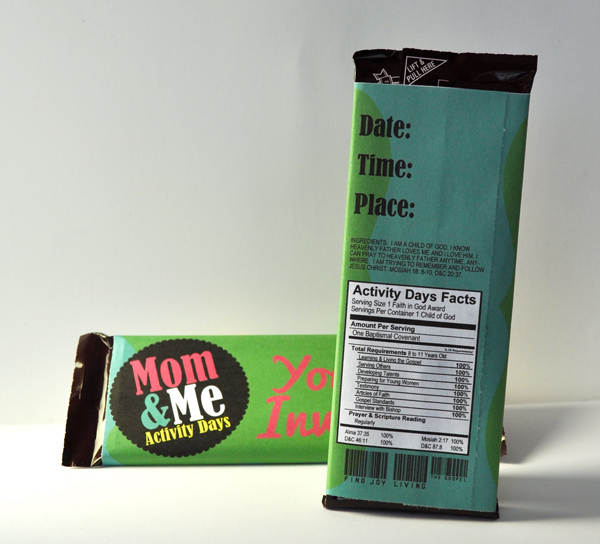 Designed to fit a Hershey’s 1.55-ounce candy bar and other similar-sized bars, this eye-catching wrapper will help motivate and reward the Young Men in your ward or stake. 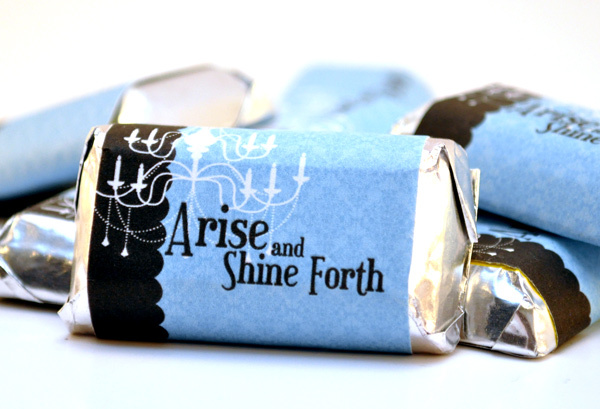 Use this candy bar wrapper in conjunction with my YW candy-bar wrapper for Standards Nights, Mutual-theme firesides, combined YW/YM Mutual activities or Youth Conferences. Or, give them to the Young Men in your ward for birthday gifts, Priesthood lessons and YM Mutual activity nights. One of these candy bars would make a great prize for a scripture chase or other contest! In my download, I’ve included two files. The first is a .pdf of the candy-bar wrapper. The second file is a high-quality 300-dpi .jpeg which is ready to print or edit in your software. When you print out these wrappers, make sure you use the highest-quality setting on your printer for best results. 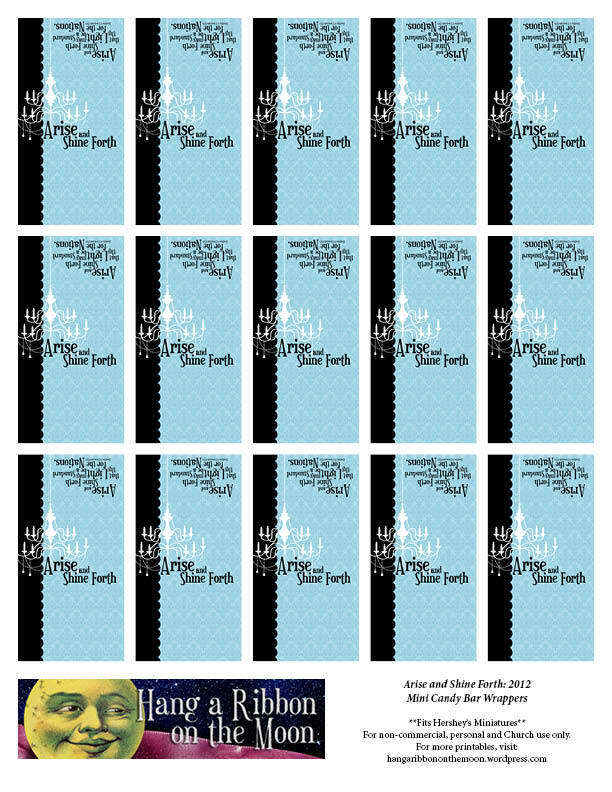 “Like” Hang a Ribbon on the Moon on Facebook and let me know what you think of this latest project! And, follow this blog to get up-to-the-minute updates on new posts and projects here. (Find out how in the far right-hand column.) I LOVE my “likers” and followers and I will NEVER sell or give away your contact information. 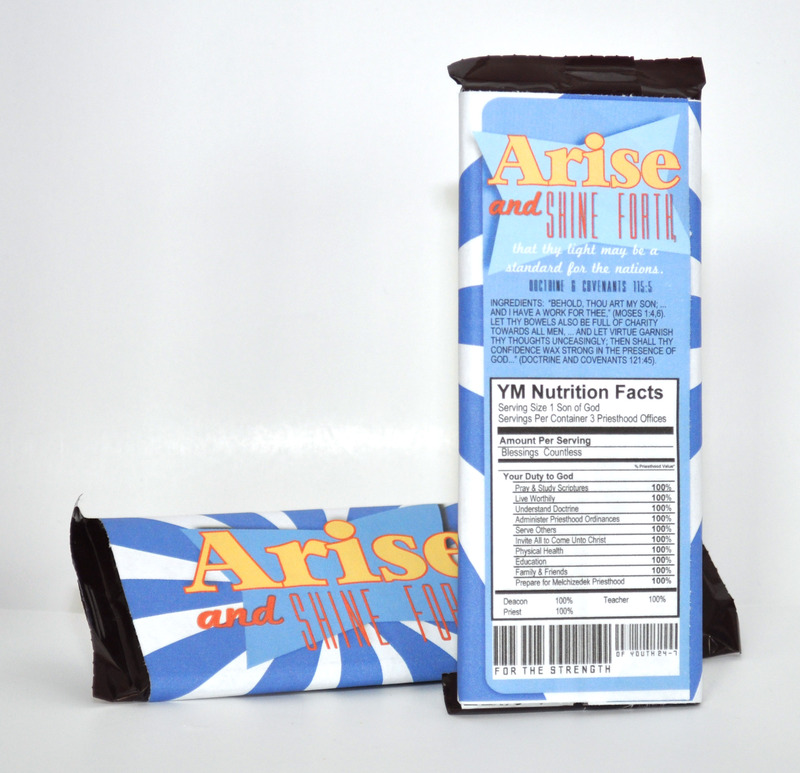 You can download my 2012 Mutual Theme YM candy bar wrapper files here. Remember, you will need to UNZIP the downloaded file before you can use it. Please, don’t share my files in any way! Send your friends here to download their own copies! When I was an Activity Days leader, some of the most successful activities we had were “Mom & Me” activities. Sometimes we did them in conjunction with a Recognition Activity, but we also did them as stand-alone activities. Have you considered having one of these for your Activity Days girls? Why not! And to get you started, I thought I’d share a cute printable I’ve designed to be used as an invitation to an Activity Days Mom & Me activity. As you can see, it involves one of my favorite snacks, chocolate! 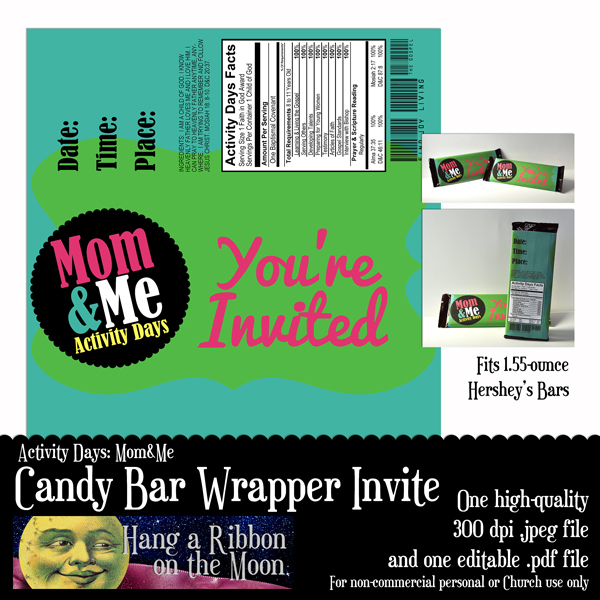 It’s a candy-bar wrapper invitation! an interactive .pdf file, with text fields where you can add your information once you’ve opened the file in Adobe Reader. You cannot save the text you add, but using an interactive .pdf is a quick and easy way to add your individual details to the wrapper. Adobe Reader can be found here for free and most people already have it installed on their computers. 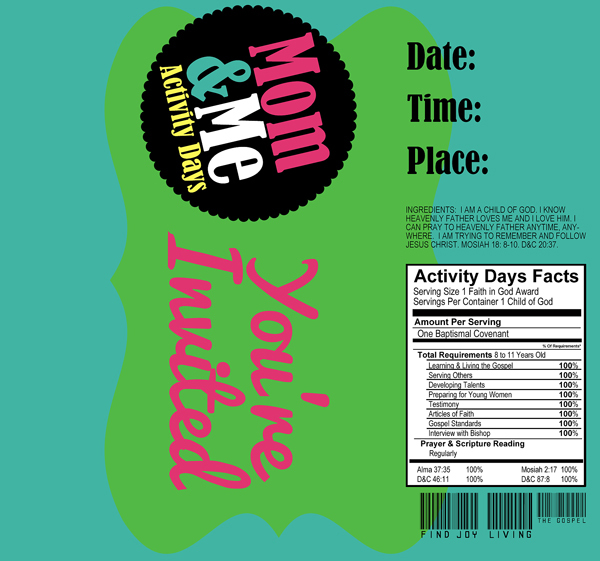 Over the next while, I will have more Activity Days Mom&Me printables including posters, cupcake wrappers and a photo frame and more plus a few ideas on Mom & Me activities you might consider doing for your next Activity Days event. Don’t worry, I also have some Young Women’s printables coming as well. Don’t miss a post by following to this blog or liking Hang a Ribbon on the Moon on Facebook. I love my followers! Remember, you will need to unzip the files before you can use them. Thanks so much for visiting Hang a Ribbon on the Moon! A wonderful reader asked for a candy-bar wrapper to fit the standard (1.55-ounce) Hershey’s Chocolate bar–and so I put one together for her. I’m excited to share it with you, too! This wrapper is perfect to give to your girls for New Beginnings, birthdays, Valentine’s Day or Christmas gifts, Young Women in Excellence, gift baskets or just because and fits the budget-friendly 1.55-ounce Hershey’s Bar. 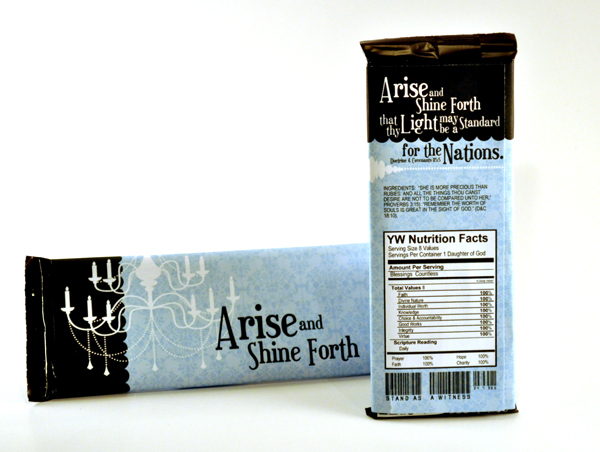 The front features my Arise and Shine Forth chandelier logo and the back has the full 2012 Mutual theme as well as an “ingredients list,” a “nutrition facts” box and a “bar code” all enhanced with YW details, scriptures and values. I’ve saved my files for you in a handy .pdf and as a high-quality .jpeg. 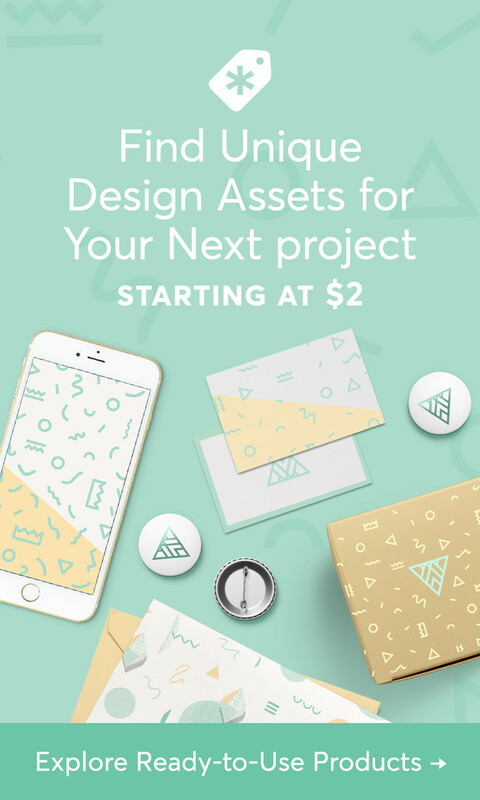 I’d love to hear how you use these–just leave a comment! I have some great projects in the works, so check back here often or follow my blog by entering your email address in the box on the right. Then, whenever I post a new project or article, you will receive an email all about it. Don’t worry. I will NEVER sell or give your email address to anyone. EVER. 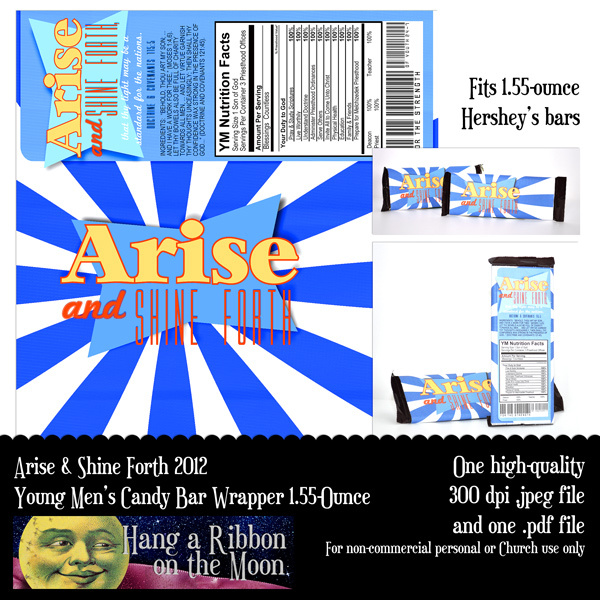 You can download my Arise and Shine Forth 1.55-ounce candy-bar wrapper here. You will need to unzip the download before using it. Please do not share my files! Send your friends here to my blog to download their own copies. All downloads are for non-commercial personal or Church use only. The download includes a .jpeg of an individual miniature candy bar wrapper as well as a .pdf of a full page of miniature candy bar wrappers, fifteen in all. And, as always, please don’t share my files with others. Simply send them here to download their own copies. All files are for non-commercial, personal and Church use only. Thanks for visiting Hang a Ribbon on the Moon and enjoy! 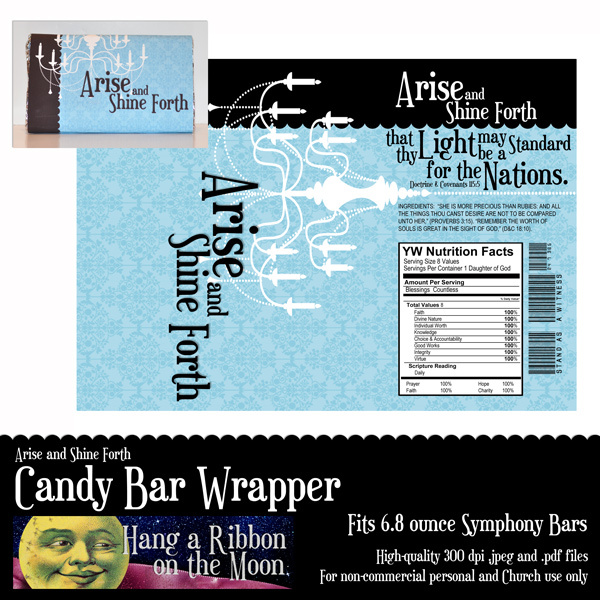 Arise and Shine Forth: 2012 Candy Bar Wrapper–a great gift idea! 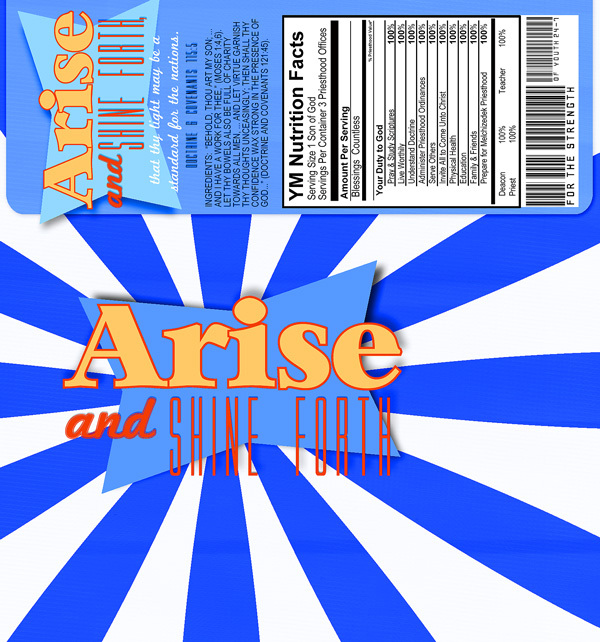 Here is another great Arise and Shine Forth download for you! This time, it is a candy bar wrapper. Simply print, trim and wrap this fun printable around a super-sized candy bar for a quick, easy and delicious birthday, Christmas or New Beginnings gift for your young women. It is designed to fit 6.8-ounce Symphony bars. I am also designing wrappers for the standard 1.55-ounce Hershey’s bar as well as for Hershey’s Miniatures. Watch for later posts with these designs. Enjoy! 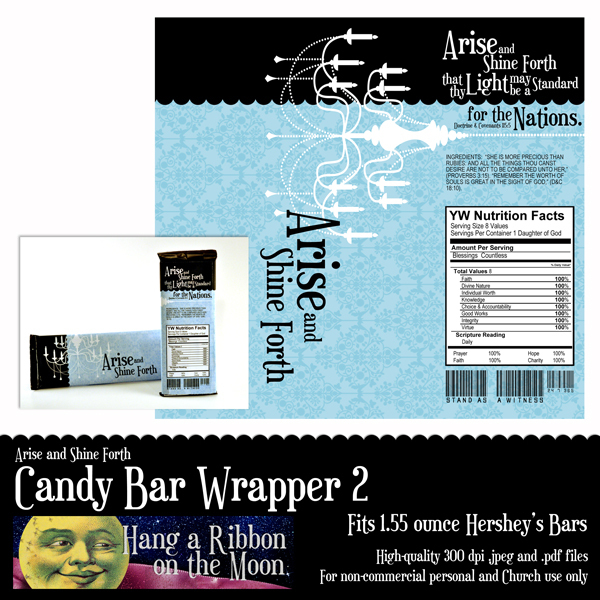 You can download both .jpeg and .pdf files of my candy bar wrapper here. As always, this download is for non-commercial, personal or Church use only! Please don’t share my files with others. Send them here to this blog to download their own copies. Welcome to my new blog, Hang a Ribbon on the Moon! 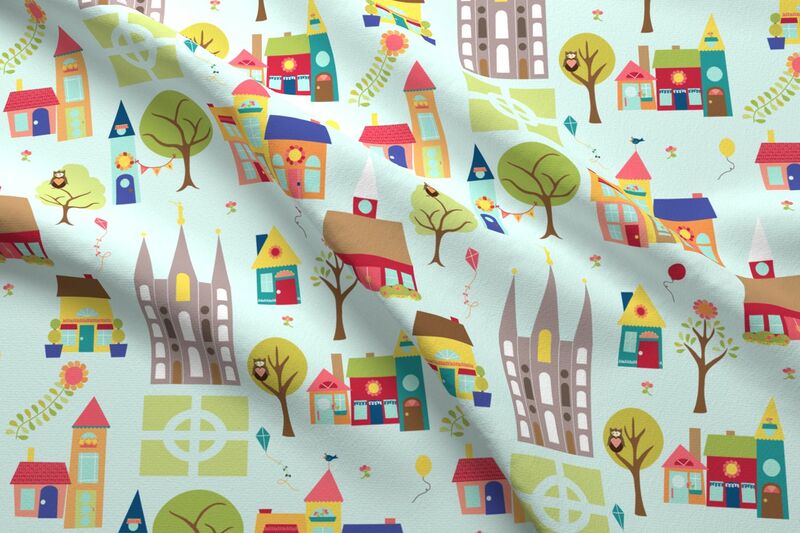 I’m thrilled to finally have my own place for sharing my designs, printables and ideas with you. And although the construction on this site is not complete, I couldn’t wait to share a free printable with you! My first project is something I made for our ward YW presidency as a birthday gift for our girls. 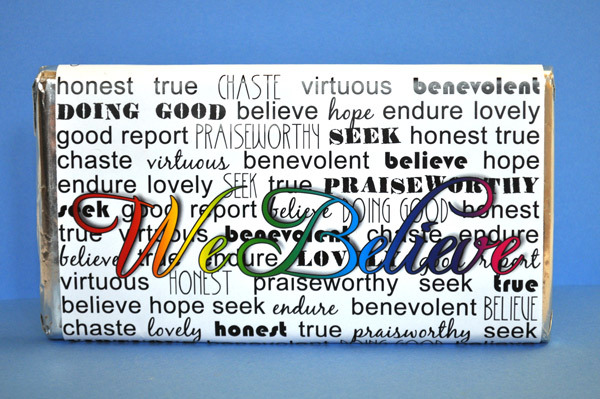 It is a We Believe candy bar wrapper designed around the 2011 theme and sized to fit the large, king-sized Symphony bars. It might be too late for you to use it as a birthday gift for the girls you teach, however, it would make a perfect Christmas gift! Note: I had a spelling error on this candy bar wrapper. It has been fixed in the download now. I hope you enjoy this free printable project! Download both .jpeg and .pdf files here. Note: Before you can use the files, you will need to unzip the download. P.S. If you want to share this project with your friends, please send them here to my blog to download their own personal copy and don’t just give them copies of the files. Thanks! I have some more great projects for the upcoming 2012 YW/YM theme coming soon, so check back! You’re going to love them!